Up until the late 1960s, hydraulic cranes didn’t even exist in this country. 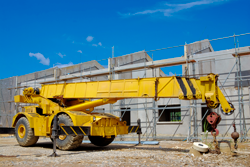 The improvement of hydraulic cylinders, pumps, drives, and the marriage of them with lighter and stronger alloy metals have made for large capacity lifts and cranes that we use today. For instance, AME has lift trucks and gantries, such as Versa Lifts and Tri-lifters that can lift and travel with 80-to-100-ton loads inside a building with ease. Cranes in the 150-to- 200-ton range can now travel on roadways easily, allowing us to mobilize to a site and back off site in a day. A task that used to take a week to complete. Mobile phones are now the size of a business card, but when they were first introduced they were essentially a shoebox that needed to be tethered to your car. Much like technology, industrial contracting has evolved to be lighter, stronger, more efficient, safer and user friendly. To illustrate, modern electronics and cranes can tell you exactly how much weight you have on the end of a hook versus 25 years ago when it was done by operator feel. He'd start pulling back on the lever and if the crane got light he knew he was close. Nowadays we can tell from a safety standpoint how close he is to the load capacity and when we’re operating safely and when to take precautions. While it’s not an invention per se, jobsite safety has become one of the biggest movements to take our industry by storm. It was once a precaution directed by the general contractor, but plants and customers have come to realize that they also need to comply with government-mandated safety principles. Many large manufacturing facilities are even going beyond and driving the criteria and protocols for meeting safety requirements, such as the type of electronics installed on the cranes and the operators’ certifications. For example, years ago, anybody could hop on the seat of a forklift. As long as their boss said, “He's good," nobody would question their abilities. Now customers are requesting proof of certifications and training documentation for all of the operators that are going to be on any piece of equipment on their site. Not to mention, the equipment must have proof of inspections, last service dates and even load testing in some cases. What’s Next for Industrial General Contracting? While no one knows what the Magic 8 Ball holds for the future of industrial general contracting, we can certainly make predictions. Will 3D printing take off? Could a new iPad app redefine how we operate? Should we re-think apprentice programs to gain a new generation of highly skilled craftsmen? Share your forecasts (and other modern-day innovations) in the comment section!